The Bangkok Metropolitan Administration is making an all-out effort to drain floodwater from the northern outskirts through Khlong Bang Sue in the hope of protecting the heart of Bangkok. Massive runoff from the north surging toward Phahon Yothin, Vibhavadi Rangsit and Ratchadaphisek roads are being blocked by Khlong Bang Sue which cuts across the three roads at Chatuchak intersection, near Sutthisan intersection and in front of the Chaophya Park Hotel respectively. The BMA has installed 17 water pumps at Khlong Bang Sue and is running them at full capacity to drain overflow into the Chao Phraya River. But overflow from Khlong Bang Sue has flowed through sewers in nearby areas. If the floods pass across Khlong Bang Sue, they will head to Saphan Khwai before reaching Victory Monument. BMA deputy spokesman Wasant Meewong yesterday said the BMA planned to drain floodwater from Saphan Khwai, if it arrives, to Khlong Samsen where 15 water pumps have been installed. Other canals which will be used to drain floodwater from Saphan Khwai are the smaller Khlong Makkasan (with five water pumps) and Khlong Bang Khen Mai (10 water pumps). The BMA wants 45 more pumps from the government to speed drainage through the canals, he said. Mr Wasant said if big sandbags in northern Bangkok delayed water inflows, the BMA could prevent floods from reaching Victory Monument. 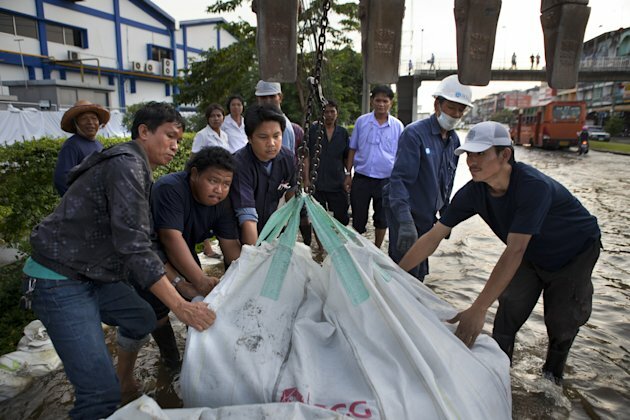 But Seri Supparathit, director of Rangsit University's climate change and disaster centre, said yesterday that big sandbags in northern Bangkok would delay inflows of floodwater from upper areas of the city for only seven days. "But in seven days, water will overflow the big bags and gush in at a rate of about 100 cubic metres per second. I think in seven days, water will reach Victory Monument and Ratchathewi district," Assoc Prof Seri said. Justice Minister Pracha Promnok as the director of the Flood Relief Operations Command (Froc) yesterday admitted that massive amounts of floodwater had yet to enter Bangkok mainly through its northern outskirts and Khlong 1 and Khlong 2 canals. He hoped that Bangkok's big drainage tunnels could cope with the water. Bangkok Governor Sukhumbhand Paribatra yesterday ordered evacuations of parts of Nuanjan and Klong Kum subdistricts of Bung Kum district. He said the levels of canals in Bangkok had started to stabilise but were still high and there were deep floods in Min Buri, Klong Sam Wa, Kannayao, Bung Kum, Saphan Sung, Phasicharoen and Chom Thong districts. His deputy Thirachon Manomaipibul said he was not overly concerned about the situation in eastern Bangkok because flood levels there were bottoming out and the BMA had received 57 pumps to drain water there. He expressed concern about western Bangkok as dykes had leaked at many locations. He said inflows would threaten Rama II Road, the only remaining route linking Bangkok and the South. 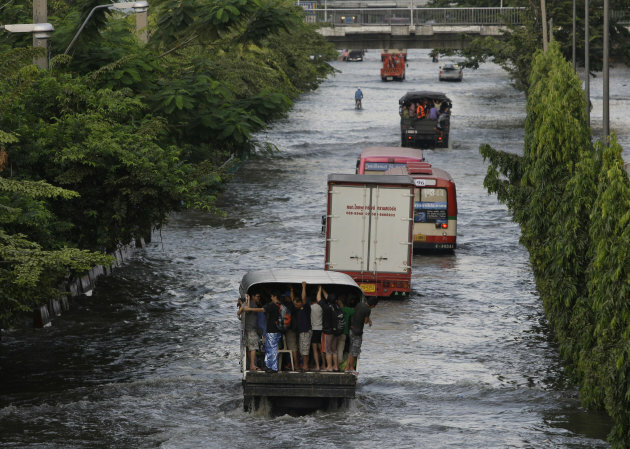 Thai residents ride a bus along flooded streets at the Saphan Khwai area in Bangkok, Thailand on Tuesday Nov. 8, 2011. 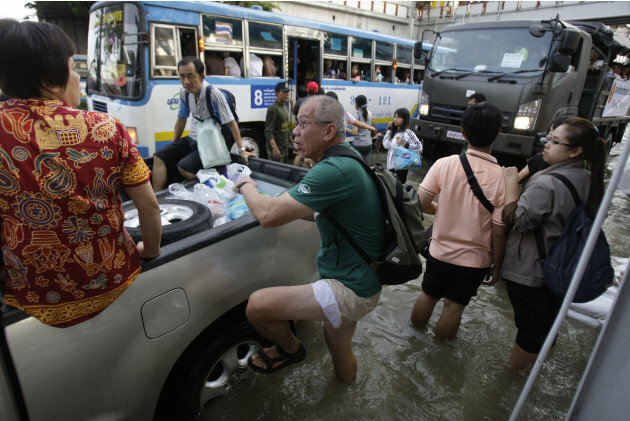 Thai residents try to get on vehicles to cross flooded streets at the Mon Chit area in Bangkok, Thailand on Tuesday Nov. 8, 2011. Water levels in key waterways near Suvarnabhumi Airport are increasing slowly, while preventive measures and monitoring of the situation are underway. The level in Lat Krabang Canal north of the airport has increased by 2 centimetres, and a branch of it in the south by 4cm. The level at the nearby Lat Krabang watergate has increased by 3cm, and at Prawet Burirom watergate by 3cm, senior airport official Suk Phuengtham said. Airport director Somchai Sawasdiphol said the situation was under control, as the flood water surrounding the compound was between 40cm and 67cm, while the flood barriers were 3.5 metres high. The military has repeated its pledge to defend the Bang Chan and Lat Krabang industrial estates from encroaching floods. Defence Minister General Yuthasak Sasiprapha said there was time left for the military to do their best. "These are two estates that have so far survived the floods. If we fail again here, we have failed right across the board," he said. 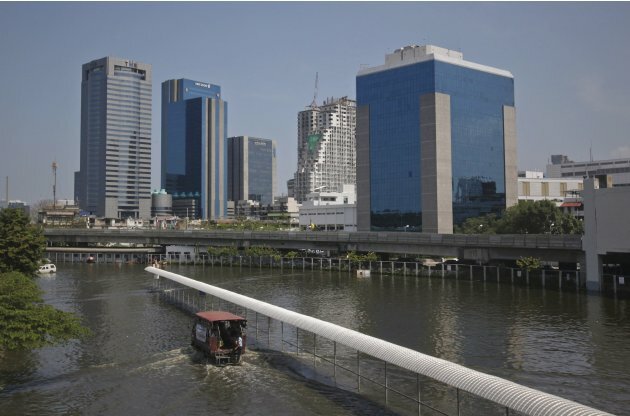 Engineering Institute of Thailand chief Thanes Weerasiri said Bang Chan was not protected by a surrounding flood barrier as Bang Chan Canal runs through it. "The best way to deal with flooding is to let the water flow as fast and in as much quantity as we can," he said. Each factory is protected by individual floodwalls of two metres high on average. Requests for water pumps have been made to the city administration. "I cannot give a 100-per-cent guarantee that the Bang Chan estate will escape the flood waters," Thanes added. A section of the Western Outer Ring Road is being cleared of flood water so as to link to Route 340 and provide an alternative to Rama II Road for journeys to the South. Transport Ministry permanent secretary Suphoj Samlom said cutting a flood channel through Rama II Road would be useless and deprive drivers of a viable route to the South. A Thai woman holds on to a truck passing by flooded streets at the Saphan Khwai area in Bangkok, Thailand on Tuesday Nov. 8, 2011. 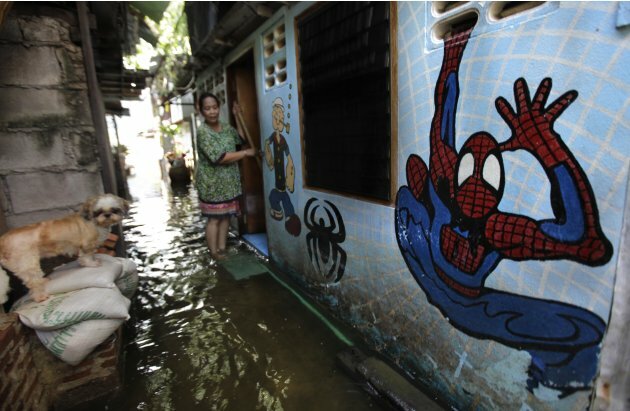 A mural of Spiderman is seen on a house as a Thai woman stands at the door of her house at a flooded neighborhood in Bangkok, Thailand, Tuesday, Nov. 8, 2011. Boiling tap water before drinking it is strongly advised for people living in flooded areas, after 72 cases of diarrhoea were reported at a Nonthaburi condominium. Drinkers are also advised to select bottled water certified by the Food and Drugs Administration or to drink from filters or purifiers certified by industrial standards, said the Department of Disease Control (DDC). A Department investigation into the 72 cases, found that each person had drunk tap water without boiling it. Boiling should be for five minutes and chlorine is provided free at the DDC, said a Department official. Salmonella bacteria were found in a few of the tap water samples collected, "but it is in such small amounts that it is not considered dangerous," said DDC director-general Dr Phornthep Siriwanarangsan. A department adviser, Dr Sopon Iamsirithavorn, said the contamination of tap water at the condo was likely caused by water from the Prapa canal being mixed with floodwater. Since tap water tanks at the condo were flushed, and new supplies mixed with chlorine, no further cases of diarrhoea have been reported. People who suffering dehydration due to diarrhoea are advised to drink 750cc of clean water mixed with five teaspoons of sugar and half a teaspoon of salt. "If the diarrhoea persists, or vomiting and bloodied bowel movements are found, they should consult a doctor," said Sopon. 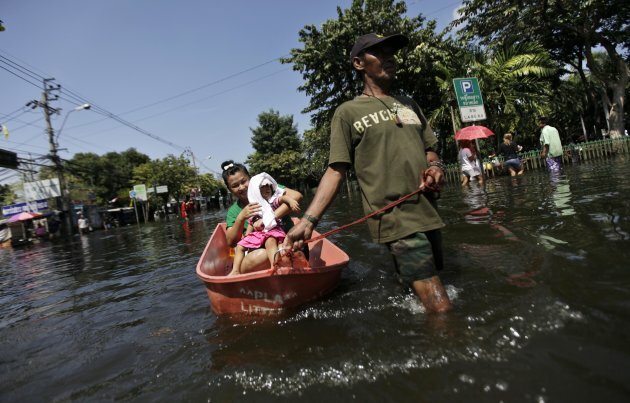 A Thai woman rides a boat as she takes her sick child to a doctor through a flooded neighborhood in Bangkok, Thailand, Tuesday, Nov. 8, 2011. A man walks at a flooded bus stop near Bangkok's Chatuchak market November 8, 2011. Some residents have escaped their low-lying homes in flood-hit areas to high-rise condominiums in inner Bangkok or resort towns away from the capital, but 30 people from the Sala Thammasop community have made their home on a railway station platform. The platform of Sala Thammasop station in Thawi Wattana district has seen an unexpected intake of flood refugees since the Maha Sawat canal overflowed its banks two weeks ago. Most of the community of 300 people decided to stay put, although some evacuated to safe places such as the temporary shelter centre at Wat Parunawas. Some of the rest decided to stay on the second floor of their properties out of worry for their houses. However, those who live in single-storey houses had no choice but to flee when the floodwaters rose further, and the nearest high ground was at Sala Thammasop train station. Even there, though, not a single square inch of the station is dry, including the platform, but it is where the water is lowest at about 10 centimetres. "Most of us don't want to leave. We know the consequences but we're ready for that because we are worried about our places. Burglars are everywhere," community leader Sayant Ketsakul said. The entire southern platform has been turned into makeshift living quarters. Some of the temporary tenants have turned the trunk space of their pickup trucks into bedrooms, while others have put up tents. The other platform across the track is free of evacuees in case the State Railway of Thailand resumes services to the station. Located between Phutthamonthon Sai2 and the shelter centre, the Sala Thammasop community is almost overlooked by aid and donating agencies. Over the past two weeks, each resident has received only two relief bags, so they mostly live on what they have. They have rice to cook for two more weeks if no more help comes, but they urgently need water and medicines. Luckily, they know they have available food right there in the water. "We can catch fish from the water flowing from the canal," Mr Sayant said. "We share rice and fish and we care for each other. That's the only way we can survive." At least the electricity is still on. The station residents play luk thung music through loudspeakers at the back of a pickup truck to cheer themselves up from time to time. The rest of a typical day, as spent for the past two weeks, is passed watching water continue to flow from the canal passing the platform to hit other districts on the western part of Bangkok. "What else can we do?" said Mr Sayant, who runs a car-cleaning business. "We know that the floods will not end soon but we will not leave here, that's for sure." A vehicle moves through floodwaters at a passenger pick-up point near Bangkok's Chatuchak market November 8, 2011. 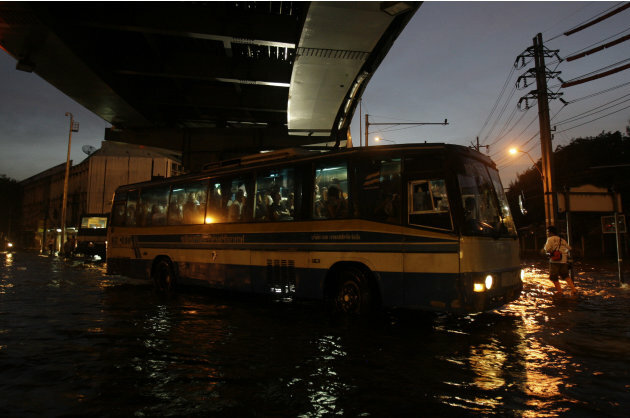 A passenger wades through floodwaters to board a bus near Bangkok's Chatuchak market November 8, 2011. Another 150 workers will be hired to collect the mounting garbage in Bangkok's flooded areas from November 10 to December 31, Governor Sukhumbhand Paribatra said yesterday. The Cabinet yesterday approved Bt3.1 billion to be spent on compensation for flood-hit Bangkok residents. Authorities have warned Bangkok residents against floating their krathongs in flood water. EM balls can control pollution in flood water, experts at Srinakharinwirot University said yesterday. 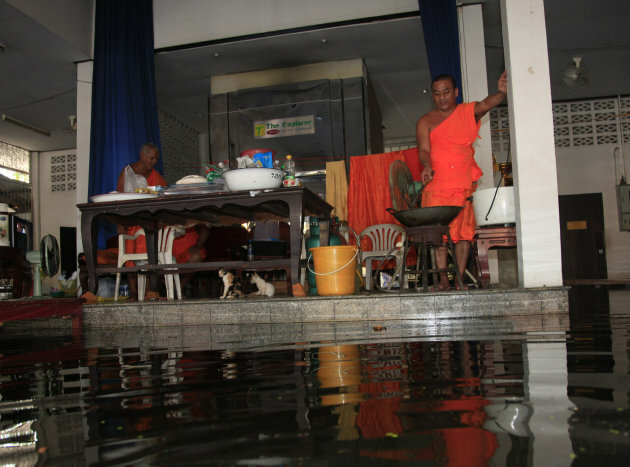 A Thai Buddhist monk, evacuated from a flooded section, prepares food at flooded Wat Wichitraram temple in Bangkok, Thailand, Tuesday, Nov. 8, 2011. 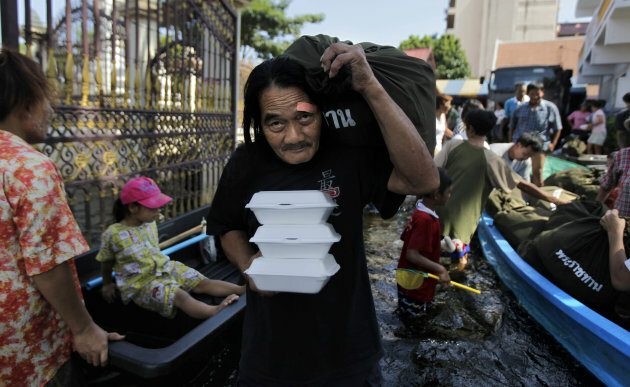 A Thai flood victim comes out from a temple after receiving relief material in Bangkok, Thailand, Tuesday, Nov. 8, 2011. Bang Chan Industrial Estate will likely be safe from flooding as water levels in nearby canals have stabilised now sluice gates in Pathum Thani have been closed, Bangkok Governor Sukhumbhand Paribatra says. The governor made the statement while inspecting the flood situation at the estate yesterday. MR Sukhumbhand said he was relieved to learn that water levels in canals near the estate have begun to stabilise after the sluice gates at Khlong 8-10 in Pathum Thani were closed. This means there is a stronger chance the estate will be safe from flooding, the governor said, adding that the estate also has a flood barrier as high as 2.15m above mean sea level. During a briefing at the estate, drainage authorities told the governor that the water in Khlong Saen Saep in the area was flowing more freely, which indicates the drainage system at the Bang Chan sluice gate was working well. Prime Minister Yingluck Shinawatra yesterday said the government will do everything in its power to protect the industrial estate from flooding, although she said she could not give a 100% guarantee it would be spared. "The industrial estate will be given full protection. We will do our best. But there is no telling if it can be 100% safe," the prime minister said. Executives of the industrial estate have asked City Hall to open a sluice gate at Bung Krathiam to ease flooding on a nearby street. Thanes Veerasiri, secretary-general of the Engineering Institute of Thailand and adviser to the industrial estate, said estate executives had sent the Bangkok Metropolitan Administration a letter seeking to lift the gate higher to 20cm. This is so floodwater on Mon Chao Sa-nga-ngam Supradit Road near the estate can be channelled into the pond and into Khlong Saen Saep, and at the same time to speed the drainage of the flooded area using water pumps. On Monday, the BMA issued an evacuation alert for Bang Chan sub-district of Klong Sam Wa district as floodwater crept into the estate and flooded nearby roads. Flooding on Mon Chao Sa-nga-ngam Supradit Road was about 20cm deep while Seri Thai Road was under 10-20cm of floodwater. However, manufacturing plants inside the estate remained dry as troops reinforced flood barriers. Meanwhile, Narong Lekprasert, an official at Bang Phli Industrial Estate, said 5,500 "big bag" sandbags have been stacked to build a barrier at the north of the estate to protect it. The estate will also increase the height of other levees so they are level with Thepharak Road. Factories there have already moved machinery to safer ground or elsewhere while efforts are being made to dispose of industrial waste, Mr Narong said. He said Bang Phli Industrial Estate will keep a close watch on what happens at Lat Krabang Industrial Estate. If a crisis alert is issued for Lat Krabang Industrial Estate, then Bang Phli Industrial Estate will alert all 130 factories to stop operations straight away to evacuate, Mr Narong said. Meanwhile, overflow from Khlong Sam Prawes yesterday inundated some parts of Chao Khun Taharn Lat Krabang Road. The water was up to 40cm high. The deluge is expected to spread to Rom Klao Road and on to Lat Krabang areas _ only 5km from Suvarnabhumi airport. Somchai Sawasdeepol, senior executive vice-president of Airports of Thailand Plc (AoT), yesterday said water levels in the canal network around Suvarnabhumi airport were not worrying. A Thai woman assists her son alight from an improvised float along a flooded slum area at Chatuchak district in Bangkok, Thailand, Tuesday, Nov. 8, 2011. A Thai flood victim pulls a makeshift raft carrying his daughter through murky floodwaters as they return home with relief material distributed at a temple in Bangkok, Thailand, Tuesday, Nov. 8, 2011. The United Kingdom's ambassador to Thailand and Laos Asif Ahmad discusses with ACHARA ASHAYAGACHAT what he has learned about Thailand's ongoing flood crisis. What would you say about how the authorities have addressed the flood crisis so far and how they have fared in communicating the threat to parties concerned _ diplomats, investors, business people? The exceptional conditions in Thailand this year from the monsoon rains and subsequent flooding have caused great difficulties for Thais and everyone who has a stake in the well-being of the country. We rely on the ability of the Thai government and the relevant authorities to provide us with timely, consistent and credible information. At the special briefing for ambassadors last week, we were given an assessment of the quantity of water that needs to find its way to the sea. We were also shown the impact of different scenarios and effects of the steps being taken to deal with the impact of water from the north and the high tide. I also visited the Flood Relief Operations Command in its two locations and spoke to some experts. Taken together, we have a better understanding of the impact of the floods not just on central Bangkok, but on the affected areas as a whole. Are you confident in Thailand's ability to weather the crisis and how soon do you think that will happen? I understand that parts of the flood-affected areas may not be clear of water until the end of the year but the impact will be reduced if it is possible to pump the water out to sea. The resources in place in Bangkok have not been tested to deal with the volume of water yet to pass through to the city. Additional pumps and measures taken by the authorities to use canals and drains will no doubt help clear the city of water more quickly. A large civic effort will be needed to recover from the aftermath of the floods as people clear up their houses, deal with debris and other public health hazards. In times of crisis, there are often accidental heroes. Who do you think deserves the olive wreath and who do you think has not performed? I see acts of heroism and courage in the face of every flood victim. The resilience of the people of Thailand is both humbling and inspirational. The communities are acting together, supporting each other and keeping spirits up in the face of the daily challenges of keeping dry, finding food, water and other essentials. I saw at first hand the impact volunteers can have in bringing vital relief to those who were in evacuation centres when I went to Ayutthaya two weeks ago. Every rescue worker and transport provider is risking their own safety as they reach out to help people caught in flood zones. Premature forecasts of the benign impact of the floods in Bangkok and incidents of announcements that were then contradicted may well have had good intentions behind them in the first few days of the floods around Bangkok. It is better to communicate factual assessments and point to practical ways in which citizens can help themselves or be assisted if they are affected by the floods. I have great admiration for the organisations including the media who are themselves affected by shortages of staff and floodwater, and yet have turned up for work every day. How soon can international offers of assistance [expertise/projects] be put in place to help sort out the problem? Thailand has not made an international appeal for assistance. Offers of help have been made and where this has been targeted, it has been helpful. The European Commission committed 10 million euros for immediate relief to flood victims in Southeast Asia. Expertise has been brought in for areas such as flood monitoring, water management and the UK has made a proposal to the Public Health Ministry to offer advice on the medical issues that will arise in the aftermath of floods. It is important that efforts by the government, international donors and the generous contributions from concerned citizens are coordinated so that the right provisions are made on the basis of acute need and the distribution channels are efficient. 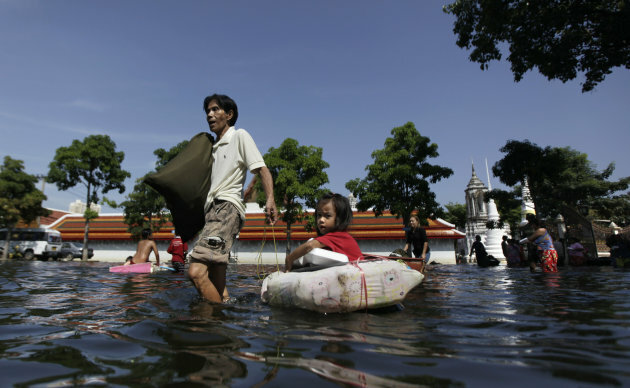 Thai flood victims wade through murky floodwaters with the relief material distributed at a temple in Bangkok, Thailand, Tuesday, Nov. 8, 2011. An empty plastic tank in hand, Sgt Narin Banpaburut pushes knee-deep through floodwater to the nearest petrol station to fetch fuel for a commuter boat. "We're out of petrol. I'll get some from a pump station over there," he said. He and other army rank-and-file have been a common sight as they offer relief assistance in Thung Song Hong area of the flood-devastated Don Muang district. The soldiers from the 11th Infantry Regiment, 2nd Infantry of the King's Guard, based in Bang Sue district, have put their weapons down and grabbed paddles and poles. They are working outside their barracks and manning a boat landing near the ramp of the expressway running parallel to the Khlong Prapa, the feeder canal for Bangkok's water production. The floods in the past two weeks have swamped roads and turned them into canals, and expressway exits into piers. Sgt Narin was assigned to drive a motor boat, but it ran out of petrol half way through the relief trip. The sergeant wastes no time refilling the plastic tank. He knows boats are the only mode of transport for communities, some of which are head-deep in water. He and his subordinates say they are suffering from athlete's foot from their daily _ and day-long _ exposure to water. They say they do not mind hard work, although boats are in short supply. "We asked the old folks to get out, but many wouldn't budge. They agreed to leave only when the water came," Sgt Narin said. The water current is strong in places, making it hard for soldiers to navigate in boats, especially at night. He said elderly people should vacate when they can. Remaining in flooded homes puts them at risk from burglars and dangerous animals. "What if someone is bitten by snakes and the boat to rescue them runs out of fuel?" Sgt Narin said. The soldiers receive some energy drinks from thankful residents. Some even offer money, which the soldiers decline. "We can't accept money. We ran away when they tried to give us some cash. So they threw the money into our boat, but we handed it back," Sgt Narin said. "People here wanted to give us something because they appreciate what we do for them. But it's our duty to take care of people in need." Pongsak Boonprasert, a rescue worker in Nonthaburi, said the soldiers had a heavy work routine but he has never head them complain. "I think they're worn out. But I must hand it to them for doing all this," Mr Pongsak said. Also, some security guards never imagined they would have to drive boats on what were dry roads two weeks ago. Sophon Suwanchairob, a security guard at the Justice Ministry, said the ministry hired him to double up as a boat driver shuttling officials between the flooded ministry and the boat landings at Khlong Prapa and IT Square near the submerged Vibhavadi Rangsit Road. A fibreglass boat accommodates up to five people. The shuttle takes many hours to bring officials to and from the landings to the ministry. "There's barely any time to breathe. I never drove a boat before but I pretend to be an experienced driver and the officials buy it," Mr Sophon said. 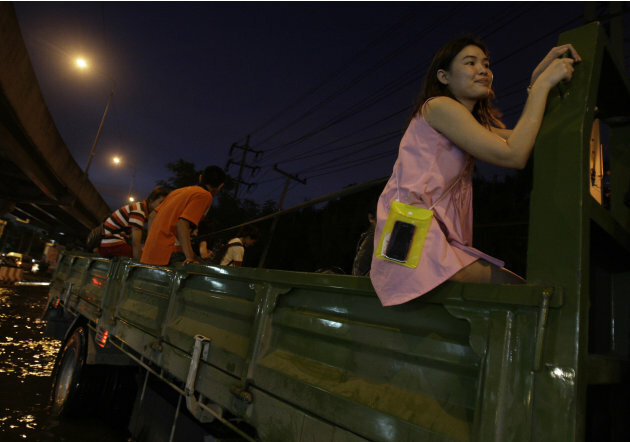 Thai residents hold on to a truck as they cross flooded streets at Mon Chit area in Bangkok, Thailand on Tuesday Nov. 8, 2011. 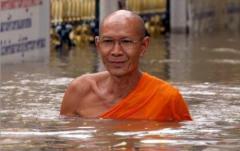 A resident wades through floodwaters at Wat Wichitraram temple in Bangkok, Thailand, Tuesday, Nov. 8, 2011. 09/11/2011 :The government has appointed a veteran economist and a close aide of His Majesty the King to help get the country back on its feet in light of the flood disaster. 09/11/2011 : The Yingluck Shinawatra government fell short of "passing the test" in terms of its performance after three months in office and its ability to handle the flood crisis, an opinion poll has found. 09/11/2011 : Prime Minister Yingluck Shinawatra will not attend the Asia-Pacific Economic Cooperation summit in Hawaii this weekend. 09/11/2011 : The Food and Drug Administration has called on owners and operators of pharmacies which have not yet been affected to stay open amid the ongoing flood crisis to solve an acute shortage of medicines. 09/11/2011 : Although Chulalongkorn University has been a comfortable refuge from the flooding for about 500 people over the past two weeks, many of them are eager to get back to work. 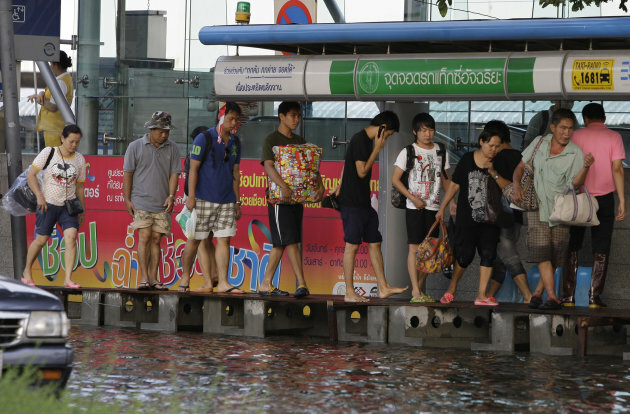 Thai residents walk on planks to keep dry from floodwaters as they alight from a train station at the Mon Chit area in Bangkok, Thailand on Tuesday Nov. 8, 2011. A Thai woman cuts ingredients for cooking along a flooded slum area at Chatuchak district in Bangkok, Thailand, Tuesday Nov. 8, 2011. Many people wait until the holidays to upgrade their home computer on the cheap. Between the pre-Christmas sales and the post-Christmas inventory sell-offs, good bargains can usually be found around the holidays. This year, I wouldn't count on such deals. As of now, much of the country of Thailand is underwater, the result of a ridiculously heavy 2011 monsoon season. To date, just over 500 people have been killed by the floods, which began in July and show no sign of letting up any time soon. In fact, matters appear to be getting worse, as the flooding is putting to the test the sewer and drainage system in Bangkok. The death toll is sad, and obviously, as human beings, we weep for those who have lost their lives, as well as the 2.3 million who have been displaced and affected by the flooding. Having said that, I would like to focus on an aspect of the flooding that has not been well-covered in the American media. Thailand is a key cog in the international manufacturing of computers. The country is the second largest producer of hard drives in the world, manufacturing some 25 percent of the world's total. The factories that produce those hard drives are now closed, as the industrial parks where they are located are under several feet of water. 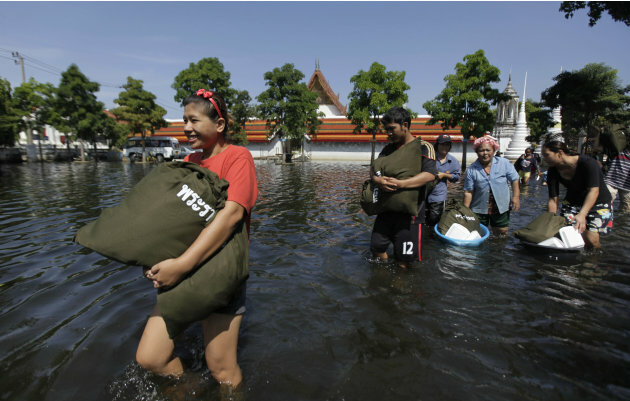 One major manufacturer, Western Digital (NYSE: WDC), has had its factory in Thailand closed for over two weeks now, as floodwaters have overtaken the area. Even when the floodwaters recede and the Thailand floods stop being a story, WDC and other Thailand-based companies could face severe waits to get back online. Flooded plants means flooded manufacturing equipment. There is no guarantee that any of that equipment will even work when the water does recede. Even if, by some miracle it does work, or is easily replaced, will the workforce be there? It's not like the company was on strike and the workers can simply come back. Cleaning up after a flood is difficult and time-consuming. 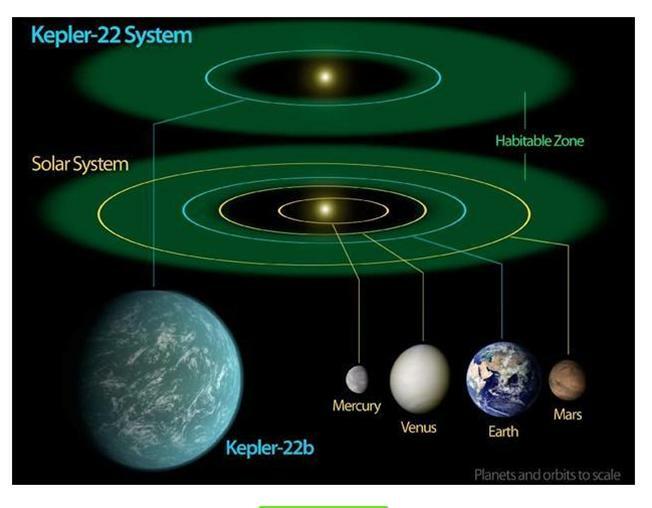 Where will the employees live? Will they be able to return home? Will there be sanitation, or will there be polluted water everywhere? These are all factors these Thailand manufacturing plants are working out right now, as they plan their rebound. In the short term, we can expect computer prices to go higher, not lower, this Christmas season. Already, hard drive prices have nearly doubled. These prices are only expected to get worse, as competing manufacturers run out of inventory and capacity to make more units. It's not just computer manufacturers that cannot get the parts they need. Camera makers like Sony (NYSE: SNE [FREE Stock Trend Analysis]) cannot get the parts they need to manufacture digital cameras. Some auto supply chains have also been disrupted by the floods. For now, experts are predicting between six and twelve months to sort out the supply chain mess, and either get Thailand back online, or get capacity up at other firms, other plants, or other countries. That means you just might want to stay away from computer shopping this holiday season, and perhaps put off your new purchase until they get this all sorted out. Of course, these higher prices will almost certainly have an effect on the American economy. If fewer people buy computers (seriously, would you buy one at a higher price today than you could have paid 6 months ago? Not a chance.) then it would follow that computing companies could be in for a rough holiday season. If so, computer makers like Dell (NASDAQ: DELL) and even Apple (NASDAQ: AAPL) could be in for a rough ride. It would make sense to monitor those stocks through the holiday season, as there might be a "buy low" opportunity after the Q4 numbers come out — if they come out weaker, of course. Given the flood and the time frame for recovery, it almost seems certain that there will be some lower numbers by then. Whether those lowered numbers stick to just the affected HDD manufacturers or if they spread through the entire system remains to be seen. But, If other investors move on and forget that some sales loss can be attributed to these supply-chain, flood-based events, then perhaps there is some profit available there for you. 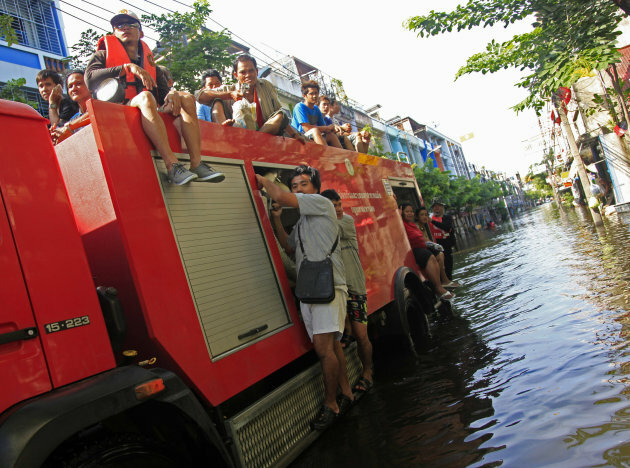 Residents ride on a fire truck through a flooded street in Bangkok, Thailand, Tuesday, Nov. 8, 2011. Thai workers grab a giant sand bag creating a wall to protect the Bangchan Industrial Estate as waters rise on the outskirts of the capitol city November 8, 2011 in Bangkok, Thailand. Thailand’s ongoing struggle against record flooding has been complicated by often contradictory statements from officials. To help calm a panicky public, a group of young Thai animators created a cartoon series to simplify flood information and help people prepare. The animated series RooSuFlood has become a hit on television and the web. 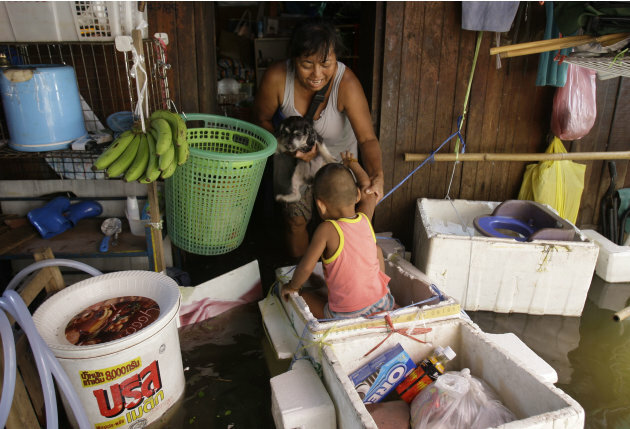 Thailand’s devastating floods caught many people unprepared, leaving hundreds dead and tens of thousands homeless. 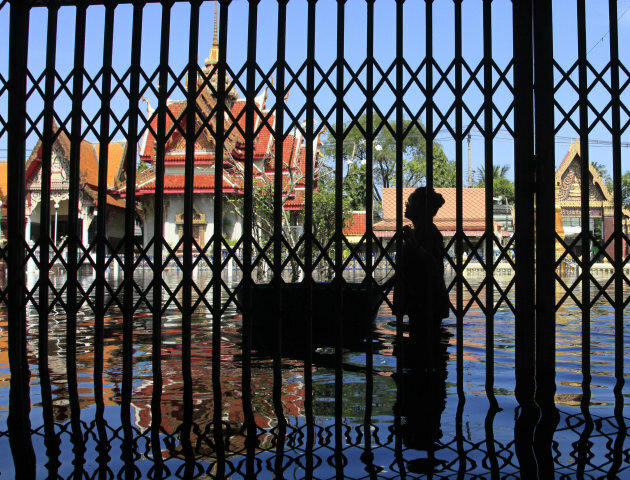 As authorities struggle to fend off waters closing in on the Thai capital, Bangkok, ordinary people are being swamped with mixed messages. Officials with the national government and the capital city government have often contradicted each other in assessing the threat to Bangkok. Prime Minister Yingluck Shinawatra has struggled with a consistent message. Last week, she said if there is no more water coming in, it might not get seriously flooded in Bangkok. Several days later, she had starkly different advice. She says in Bangkok, people might have to adjust to using boats instead of cars. As officials alternate between overly optimistic and overly pessimistic scenarios, the public is left wondering what to do. To cut through the confusion, and calm down a worried public, a group of young animators got together to create RooSuFlood. “Know and Fight Flood” is an animated series of public service announcements designed to educate while keeping the audience entertained. Subtitles in English also help foreigners wanting to know more about the situation, says Thawatchai Saengthamchai, one of the series’ creators. He says there is a flood of information with academics saying this, the media saying that, the government saying another thing and people on the street saying something completely different. He says the air is full of confused voices without anything to organize the information. To illustrate the magnitude of the crisis, RooSuFlood depicts Bangkok’s encroaching flood waters as 50 million blue whales. The animated series shows the whales trying to make their way out to sea through Bangkok’s Chao Phraya River and crisscrossing canals only to spill out onto the streets and into people’s homes. Several students and recent graduates sit in front of their computers in a modern, glass-walled gray building. Volunteer animator Sipparpad Krongraksa was flooded out of his house and, for now, he not only works at the office but also lives here. He says normally he would be sitting around in his room watching TV, but he feels that there are a lot of people who are in trouble and Ru Su Flood allows him to be more useful to society. As floodwaters slowly spread in to central Bangkok, the series turned to dealing with getting flooded and evacuating safely. Among the tips for leaving your home: pack a life jacket, plug your toilets with sandbags, and carry a large stick if you should be unlucky enough to meet a crocodile while evacuating.